From co-workers and readers, to kindred spirits I’ve never met, this week’s craft TV segment on Take Five & Company was inspired by several creative people. 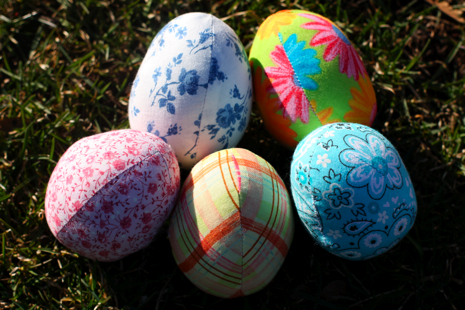 This great fabric egg tutorial by Retro Mama, Kim Kruzich, of Madison, Wisconsin caught my eye when I was surfing for Easter craft inspiration online. I whipped up a patch of samples the other night and LOVE them. Plus, it helped that the instructions are well written and easy to follow. Nice job, Kim! I was delighted to see these giant flowers suspended from the ceiling at the Grand Rapids YMCA where I like to hang out with my family. Remember the paper snowflakes I’ve been raving about for the last couple years? 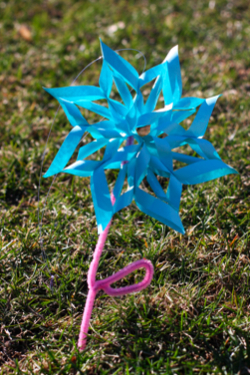 Well, Rachel Gill and Kari DeBoer at the Y transformed giant poster board snowflakes into lovely flowers by spray painting them with craft paint and then added paper stems and a leaves. The result is a very happy spring decoration. Download the directions to make the snowflake here. 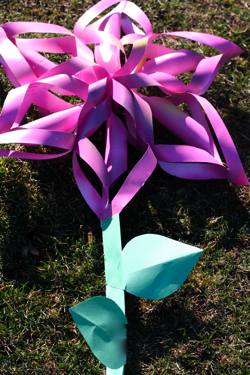 To make the flower version, you’ll need eight large square pieces of bright colored poster board (or spray paint a white flower after you’re finished assembling it. ), green construction paper or poster board and some fishing line to hang up your flower. The instructions work for any size flower. Just make sure the squares you start with are all the same size. These are fun in miniature poking out of the ground from pipe cleaner stems. I was inspired by my co-worker Kathy Carrier to try a simple and fantastic Easter Egg decorating technique that she used to prepare for a recent Grand Rapids Press Food cover shoot. 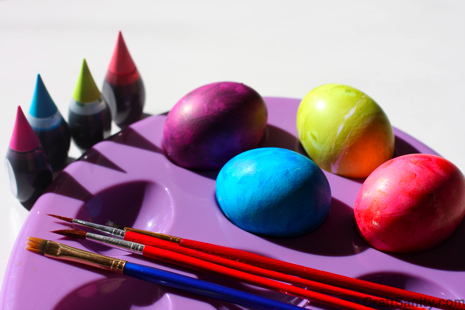 Instead of using an official egg decorating kit, Kathy painted her eggs with neon food coloring. It only takes about a drop of food coloring to cover an egg and the colors are amazing. I painted eggs yesterday with my daughters, Abby, 4, and Amelia, 3, and we had blast. We all had stained fingers when we were done, but the neon faded by the end of the day. This is a great way to achieve vibrant colors without having to mix a bunch of dyes. If you haven’t tried this, I highly recommend it. crafting on TVPainted Easter EggsPaper FlowersWZZM "Take Five & Company"
My partner and I absolutely love your blog and find most of your post’s to be exactly I’m looking for. can you offer guest writers to write content available for you? I wouldn’t mind creating a post or elaborating on many of the subjects you write with regards to here. Cool web log!